GE (General Electric) developed the first induction cooktop in the 1980s, but it wasn't until Diva popularized induction in the 1990s that it started to become popular. It sold for $3,500 for four basic induction burners. Now you can buy a basic Frigidaire induction cooktop for about $1,600. However, the best induction cooktops have larger burners and bridge elements (to fit odd shaped pans) as well as advanced technology and controls. We will look at the best induction cooktops you should consider. First, let's look at what induction is and the many benefits of buying an induction cooktop. We cover this more extensively in our Induction Cooking Buying Guide, but induction is a magnetic heat. The magnets excite the metal molecules in your pan. The pan cooks the food, bypassing the glass cooktop. Induction is by far the fastest heat and offers an instant simmer. Because the glass surface does not heat up, it is the easiest to clean and the most child safe. Induction requires less venting and can even be downdrafted, unlike professional gas ranges or cooktops. Almost every manufacturer now offers induction cooktops, and below, you'll see my top 5. Any promotions listed may be time sensitive. Always call us to get the most accurate pricing. The Jenn-Air induction cooktop offers a nice, sleek stainless 7mm trim, reducing any nicks or dents along the outer edge. They offer bridge burners with their induction cooktops. A bridge burner connects the front and back burners together for larger pots or griddles. Together, the two burners add to a whopping 5,000-watt super burner. Jenn-Air will offer a sensor boiling function. This will automatically select the optimal power level to boil water in haste, and once it reaches its boiling point, it will maintain that temperature by adjusting the power level to minimize the likelihood of spillovers. Boost Setting: Allows you to achieve temperatures higher than the normal boil setting for 10 minutes; great for frying or searing. It will pull power from other burners for timely cooking. The Jenn-Air cooktop is a great buy. Currently, if you purchase their cooktop and a single or double wall oven, refrigerator, and dishwasher you receive a $1,300 instant rebate. You're basically getting the dishwasher for free. Add in any built-in refrigerator and you will get an instant rebate of $2,000. Plus installation rebates are available. 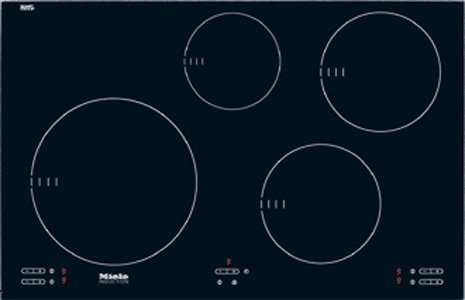 The Miele induction cooktop is another fantastic piece. Compared to the Jenn-Air, it will offer a sleeker look along with a cleaner design. Miele’s German engineering is the best in the industry. Nearly 96.8% of the parts are produced directly by Miele. This means high-quality control, a solid reputation for reliability, and less service calls for you. Their cooktop offers stainless trim and cleaner looking burner rings, as well. 1 Vario Zone of 4 - 6"
2 Vario Zones of 6 - 9"
1 Vario Zone of 7 - 11"
Auto Heat-up: This function reduces the initial power boost and prevents burning. Residual Heat Indicator: This special safety device alerts you to residual heat from a specific burner after that burner has turned off. Twin Boosters: You can combine the power of two separate burners' cooking zones in a single unit. Power Flex allows two zones into one unique burner. Wolf has long thrived as true luxury appliances. Wolf is owned by Sub-Zero, one of the best premium names in home appliances. Wolf induction has the quickest response with its cooking controls. 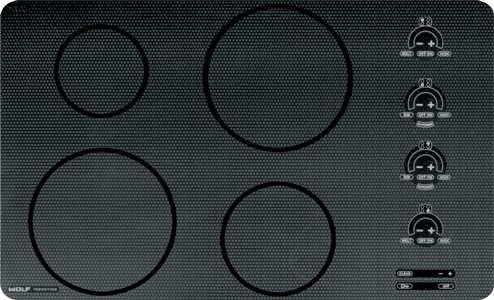 With flexible cooking configurations, its four elements accommodate a wide variety of pan sizes. A new feature, the bridge burner, connects the burners so you may use bigger pots or a griddle. The design of the black pixel glass gives it a sleek appearance while hiding any scratches. 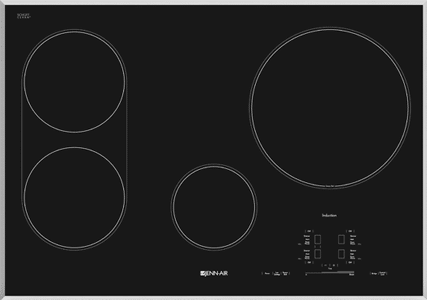 The layout of the control panel is on the right side of the cooktop, it is different from other manufacturers. By placing the control panel on the right side, it allows pots and pans to spread out evenly with plenty of space between them. Melt setting: melt setting for gentle heat, and true simmer setting prevents scorching. Independent timer up to 99 minutes. Wolf has a sales promotion now that if you purchase a cooktop, a wall oven, and a built-in Sub-Zero refrigerator, you will save an additional $1,000 in mail-in rebates. Plus you get points to put towards purchasing Wolf pots and pans, toasters, blenders, or a small convection oven, for example. Thermador is part of BSH Home Appliances Corporation - a fully-owned subsidiary of Bosch and Siemens Home Appliance Group. It is the third largest appliance manufacturer in the world. 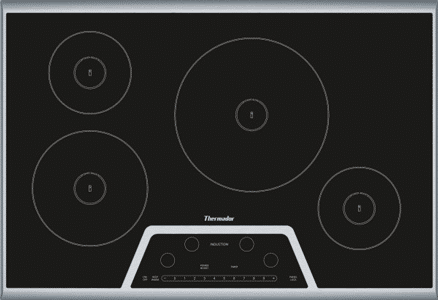 Thus, it is natural for Thermador to create a top-notch induction cooktop. Thermador technology has the most user-friendly power settings. Each power point setting pins to the accurate temperature from sauce to sauté. From a novice to a professional chef, this cooktop offers precise cooking. Thermador induction has the “Power Boost” option for up to 3,700 watts. Thermador is one of the most powerful induction products in the industry for a single (non-bridge element). 11" burner 2400 watts with a 3600 boost. They have the most aggressive incentives. You can buy a cooktop and wall oven for a free dishwasher, buy a built-in refrigerator to get a free hood, and up to $5,000 in savings. 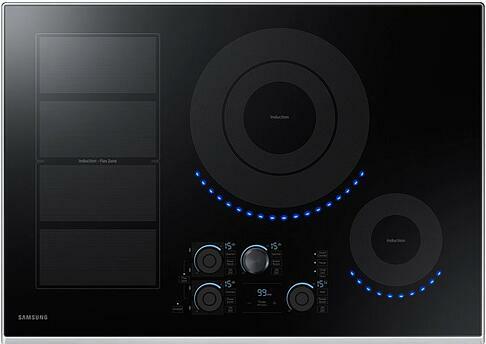 Samsung developed their first induction cooktop this past year. They have unique features like Wi-Fi and Bluetooth connectivity. They also have digital controls or analog controls. A very cool feature of this induction cooktop is the blue LED lights that give the burner blue flames making it look like a gas burner. Because of its technology, this induction cooktop is the most innovated in the industry. You can be watching TV and check on the cooktop through an app on your phone and even shut it off. These are additional features that come with this cooktop. Flex Zone: 7 11/16" x 15 3/4"
The 2 left burners are part of the Flex-Zone, which means the 2cooking zones can be used as one big surface. For example, you use a griddle for pancakes on Sunday morning while using the flex burner to poach salmon. So, which is the best 30-inch induction cooktop? The new induction cooktop on the market is the Samsung. It has great features like the flex-zone that gives you a big cooking surface to put large pans on. It has some unique features like the Wi-Fi, Bluetooth, and Virtual flame so you know it is on. 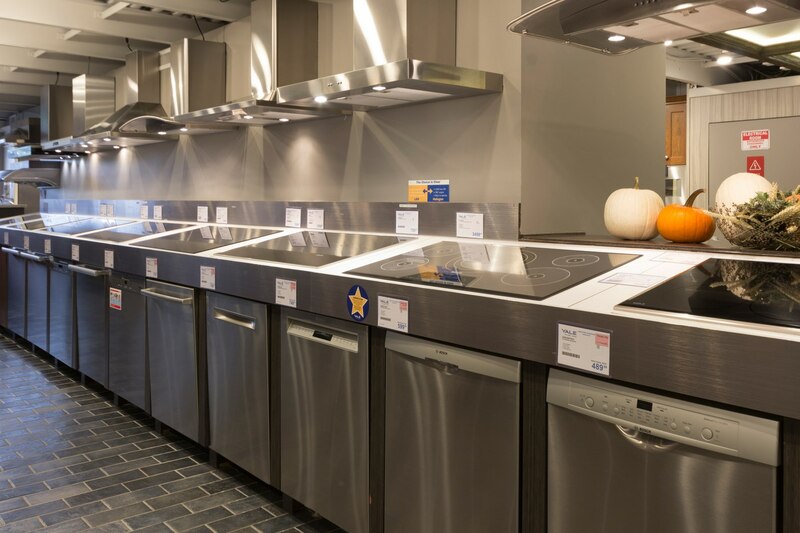 From a quality standpoint, Miele is statistically the best. They are widely solid and have a strong reputation for producing a great quality product. The Wolf has a better, more precise control panel, and it shows less wear because of its weave pattern. Also, it has the bridge burner for more flexible cooking. However, in terms of value, the Jenn-Air is a great option and is currently the most aggressively priced for packages. If you buy four Jenn-Air pieces you can get an instant $1,300 rebate. Thermador has a great layout of burners and a large burner in the center. I like the simple controls by using the numbers instead of sliding your finger around the controls. Thermador has rebates on their four-piece package of appliances as well. 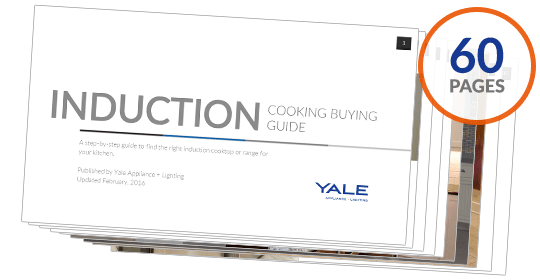 Download the Yale Induction Cooking Buyers Guide with features, specs, and wattages of every induction cooktop in the market. Over 220,000 people have downloaded a Yale Guide. Editor's Note: This article was originally published on January 3, 2014, and has been updated for accuracy, freshness, and comprehensiveness.